This weekend heralds the traditional start of the English Football season with the annual curtain raiser, the Charity/Community Shield. This year’s edition will again feature perennial competitors Manchester United who take on last year’s FA Cup winners Wigan Athletic. But back in the mid 1980’s it was Everton who had a stranglehold on English footballs ‘super cup’, with the Charity Shield resident in the Goodison trophy cabinet (yes we do have one) for 4 consecutive years from 1984 to 1987. After the brilliant FA Cup win over Watford in 1984, which broke a 14 year trophy less spell for the Blues, Everton returned to Wembley in August of that year to take on Merseyside rivals Liverpool. Having narrowly lost out to Liverpool in the League Cup final earlier that year, Howard Kendall’s Everton were determined to leave Wembley with happy memories and won the shield with a comical own goal from the Reds very own resident clown Bruce Grobelaar. 12 months later and Everton were back at Wembley to take on Manchester United. The Blues were still smarting after the Red Devils had denied Kendall’s Blues a famous treble with a narrow one-nil win in the previous May’s Cup Final. This time Everton were far superior, winning two-nil with goals from Trevor Steven and Adrian Heath to add the Charity Shield to the League title and European Cup Winner Cup from the previous campaign. 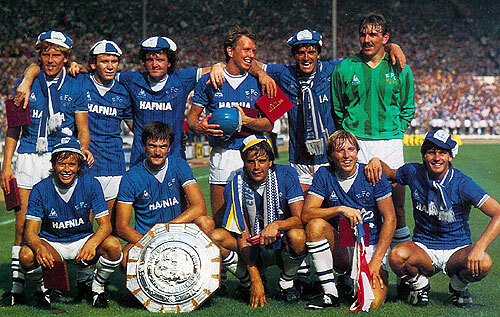 The 1986 edition of the Charity Shield was another all Merseyside affair. Liverpool had piped Everton to both major domestic honours and Everton still led by Howard Kendall were determined to bring success back to Goodison. The sides had been so evenly matched the year before, but Everton had lost Gary Lineker to Barcelona and Liverpool were many people’s favourites to retain England’s biggest prizes. Everton though had Adrian Heath back in tandem with Graeme Sharp in attack and Heath scored Everton’s goal in a 1-1 draw which meant the shield was shared. Everton were brilliant that season and overcame significant injury problems to reclaim the League title. 1987 and Everton had a new foe. Coventry City had upset Tottenham to lift the FA Cup in a memorable showpiece event at Wembley. The Sky Blues had won many admirers and the romantics would have liked them to lift a second Wembley trophy. Everton had entered a period of significant change, Howard Kendall had departed for Spain for the opportunity to manager Athletic Bilbao and Colin Harvey was in charge for the first time. Harvey was immensely popular at Goodison, loved by players and fans and everyone wanted to get the new Everton manager off to the perfect start. Everton were victorious, a solitary strike from Wayne Clarke just before halftime enough to ensure the Shield travelled back to Merseyside aboard the Everton coach. Let us know your Charity Shield memories, especially those regular trips down to Wembley in the mid 1980’s. Previous Post Would you really want a big money takeover at Everton? Plus in 1986 we were there only as runners up in bothLleague and FA Cup .